The DS2782 measures voltage, temperature and current, and estimates available capacity for rechargeable lithium ion and lithium-ion polymer batteries. Cell characteristics and application parameters used in the calculations are stored in on-chip EEPROM The available capacity Registers report a conservative estimate of the amount of charge that CAN be removed given the current temperature, discharge rate, stored charge and application parameters. Capacity estimation reported in mAh remaining and percentage of full. 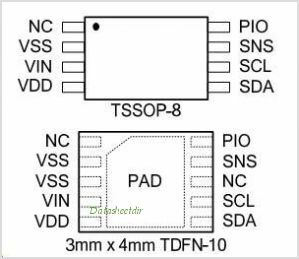 This is one package pinout of DS2782,If you need more pinouts please download DS2782's pdf datasheet. 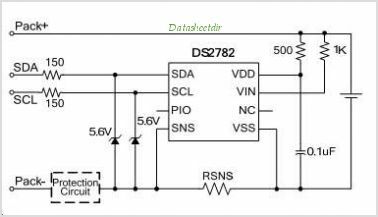 This is one application circuit of DS2782,If you need more circuits,please download DS2782's pdf datasheet.